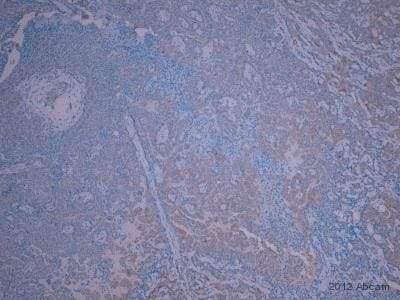 Rabbit polyclonal IL-4 antibody. Validated in WB, ELISA, Neut, sELISA and tested in Human. Cited in 21 publication(s). Independently reviewed in 1 review(s). Recombinant human IL4 protein (ab9623) can be used as a positive control in WB. Our Abpromise guarantee covers the use of ab9622 in the following tested applications. WB Use at an assay dependent concentration. Detects a band of approximately 15 kDa. To detect hIL-4 by Western Blot analysis this antibody can be used at a concentration of 0.1 - 0.2 µg/ml. Used in conjunction with compatible secondary reagents the detection limit for recombinant hIL-4 is 1.5 - 3.0 ng/lane, under either reducing or non-reducing conditions. Detects a band of approximately 15 kDa. ELISA Use at an assay dependent concentration. To detect hIL-4 by direct ELISA (using 100µl/well antibody solution) a concentration of at least 0.5µg/ml of this antibody is required. This antigen affinity purified antibody, in conjunction with compatible secondary reagents, allows the detection. Neutralising Use at an assay dependent concentration. To yield one-half maximal inhibition [ND50] of the biological activity of hIL-4 (1.50 ng/ml), a concentration of 0.03 - 0.05 µg/ml of this antibody is required. Sandwich ELISA Use at an assay dependent concentration. Can be used as Detection antibody with recommended pair. Publishing research using ab9622? Please let us know so that we can cite the reference in this datasheet. There was a misunderstood, she uses formaldehyde as fixative. Andall her samples are paraffin-embedded tissue. A good alternative to tonsilis spleen and maybe also tissue from the digestive tract, for instance colon or small intestine. DISCOUNT CODE:*** Expiration date: May 13, 2012 I am very pleased to hear you would like to test ab9622 in mouse. This code will give you 1 freeprimary antibodybefore the expiration date. To redeem this offer, please submit an Abreview for ab9622 in mouse and include this code in the “Additional Comments” section so we know the Abreview is for this promotion. For more information on how to submit an Abreview, please visit the site: www.abcam.com/Abreviews. The code will be active once the Abreview has been submitted and can be redeemed in one of the following ways: 1) Call to place your order and mention the code to our customer service department; 2) Include the code in your fax order; 3) Place your order on the web and enter the promotional code. Any feedback that you can provide will be greatly appreciated, whether positive or negative. If you have any further questions, please do not hesitate to contact us. We look forward to receiving your Abreview and wish you luck with your research. The terms and conditions applicable to this offer can be found here: www.abcam.com/collaborationdiscount. I ordered ab9622 ( interleukine-4) for IHC staining, but in the spec. sheet there was no information if antigen retrieval is neccesarry. Could you please help me out? Could you please tell me if there is other control material except mama carcinoom? Normal human spleen and lymph node should be a good positive controls. The antigen retrieval is mentioned under the IHC-P image on the datasheet- sodium citrate buffer (pH 6.0)- and other main specifications of the protocol used.